The Whitman, which broke ground in late 2004 as the housing boom approached its peak, has started closing on its 182 condos. Beginning in November 2006, 45 sales were recorded by year's end; an additional 23 were recorded through the first half of January 2007, leaving 114 to go. What's been interesting to observe is how quickly buyers are trying to flip their units or, realizing the difficulty in doing so in this market, rent them out. Some owners are advertising their units before the sale's been recorded by the District. A little research found nine units listed for rent in craigslist and seven listed for sale in the MLS. For example, unit #901, a one bedroom condo, is available for $2000 / month. Unit #550, 2 BR/2 BA, is yours for $2600 / month. The most expensive rental was a $4500/month 2/2.5. Five of the seven units listed are being sold by McWilliams Ballard, the building's marketing firm. I've also heard that they're still throwing sales parties for the building. Actually, if you go to the Whitman site, they have a two day party advertised on the main page. Bubbleicious, baby! Given Sonata, Madrigal, Vista, and Yale Steam are bringing another 1000+ units on line this year, ya think they'll sell these at those outrageous prices? I went by the building and they now only have 10 units left. In a few years we will look back and realize $500/foot was inexpensive for a property at the Whitman. Investment at the Whitman is a poor idea-an ugly and poorly designed building. The developer was greedy in squeezing the unit size down to add more units to the overall count. The result? Units too narrow to lay out furniture and the awful loft units at street level on M Street, with perpetually covered tacky blinds on the floor to ceiling glazing. Great location, piss poor building. I disagree with the commentary about the Whitman being an ugly or ill-constructed building. 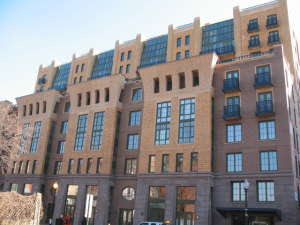 If they moved the building to Foggy Bottom the ground floor units would sell. I have thought of buying there but safety is my concern, particulary for a ground floor unit. Good building, not-yet-good location. Unit 112 seems to be a short-sale bank foreclosure. Listed at $440,000 with parking (MLS #: DC6360930), a bargain compared to the current asking price of $490,000, without for from the developer. Not that the price is good at $475/square foot. That is relative to prices several years ago before the boom. Quite a few units on sale in the building and high condo fees for a new building. If we were starting a cyclical real estate cycle, I would buy. But guessing it will take ten more years for the safety issues to be addressed (it is priced as if its in a good neighborhood), I would only consider a unit at $100,000 off that included parking. Unfortunately, we will all suffer as the prices work themselves out to something reasonable. I am still willing to pay $500,000, for a really nice condo, but haven't found it yet. Looking for entertainment space, new build, larger building, 1 bedroom, den, or two bedroom, parking and while I am at it, throw in a roof terrace. LOL. Okay, I'd spring for $50,000 mor for the roof terrace with a view of the Washington monument. I visited the Whitman. The lobby is great. The sales team said they have 24x7 concierge, which is unheard of in a condo building. The tour I was given by the sales guy (he was CUTE, too!) was impressive. Nice common areas, and a stunning roof top pool! There isn't anything available there that I wanted (outside space, 2 bedrooms), but if there was, I'd be all over it.